Originally built as Grandview Medical Center in 1998, Parkridge West Hospital became part of Parkridge Health System in March 2014. 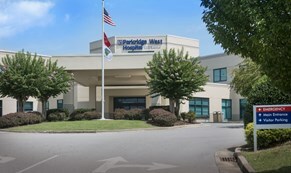 Parkridge West Hospital serves residents in the Sequatchie Valley, which includes Sequatchie, Marion and Grundy counties in Tennessee as well as areas in northwest Georgia and northeast Alabama. Parkridge West provides 24-hour emergency medical services as well as outpatient services that include diagnostic imaging, outpatient laboratory services and outpatient physical therapy. The campus is also home to Parkridge Valley West, the hospital’s 28-bed adult inpatient behavioral and psychiatric service line that also includes an intensive outpatient behavioral health program. Poised for growth, Parkridge West is continually assessing the medical needs of the community and providing additional services and healthcare access in the rural areas.